Construction companies are losing more than $1 Billion annually to equipment theft and vandalism. Cobalt Security understands the cost of replacing items stolen and the time lost due to delays in waiting for more equipment resulting in a loss of productivity. Our CCTV set up on your site will help keep your employees honest and assist in identifying people that steal from the site. Of course the cameras, along with our security guards and / or security patrols strongly deter unwanted guests from visiting the site after hours. We will also post signs around your site showing that the area is patrolled and guards are on duty. 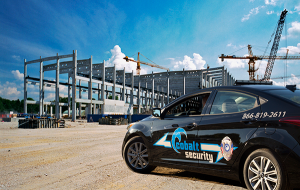 For more information about Construction Site Security by Cobalt Security Services, Contact Us today.